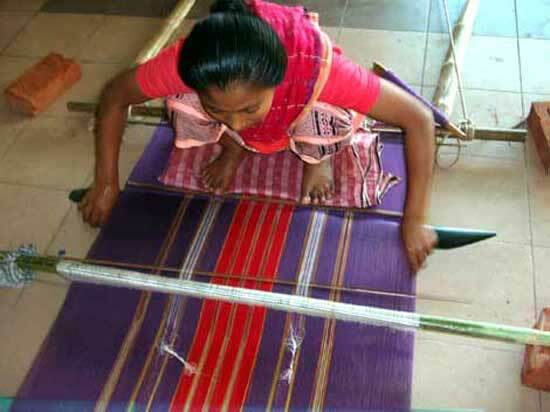 To many of us, the name Manipuri stands for colorful hand-woven saris and shawls. To other it is synonymous with classical dance. But the exotic images tell only part of the story, Beyond the colorful facade, the history of the Manipuri people is one of conflict, deprivation and exile. Following political intrigue in the eighteenth century, a large number of Manipuri fled their homes and took refuge in greater Sylhet, as well as the Indian states of Assam and Tripura. These people had Indo-Aryan features and called themselves Bishnupriyas. Long before their exodus they had lost control of Manipur to the rival clan of Meiteis. In their adopted land their lives and limbs were safe; but their language and culture began to lose ground against those of the majorette. Meanwhile, the Meiteis in Manipur became vindictive and imposed a de facto ban on Bishnupriya language and custom. The Bishnupriya Manipuris were caught between a rock and a hard place. 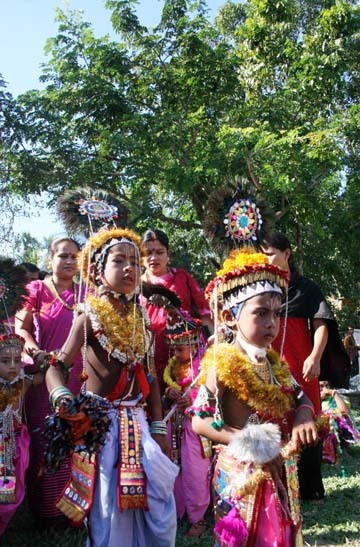 Today, young Manipuris are no longer sure of their cultural identity. 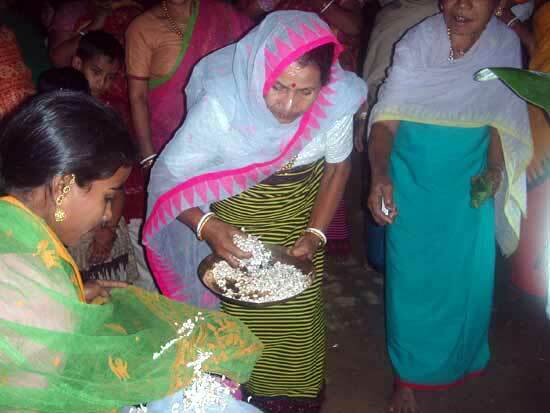 Elders worry that their rich heritage may not be preserved for posterity… An Article written By Syed Zainul Akmal Al-Mahmood, Sylhet, Bangladesh. The Village of Ghoramara, 5 miles south of Bhanugach rail station in Moulvibazar district, is buzzing with excitement. It is the eve of Durga Puja and there is to be performance of Ras Lila, beginning at midnight. The Ras is a unique Manipuri function – the dance drama that put Manipur firmly in the cultural map of subcontinent. In times of yore, the Ras may have been performed by the Sevadasis of temples, but these days it very much a socio-religious ritual in which amateur artists perform with gustho. A group of fifteen has been practicing behind closed doors for weeks. We go on a tour of the Mandap, the covered area in front of the temple where the Ras will take place. Workers are busily constructing a fancy stage – a round enclosure, all frills and intricate designs. Elder look on with solemn attention while small children, rosy-cheeked with excitement, dance and play. “Mixed-up” is the right phrase to describe the society. The most controversial class of people”, said GK Ghosh in his book ‘Tribal and their culture in Manipur and Nagaland’, “ having no homeland of their own, subsequently losing their identity are Bishnupriyas. Rival clan claim they are not “real” Manipuris. The clues of this riddle lie in the checkered history of Assam. 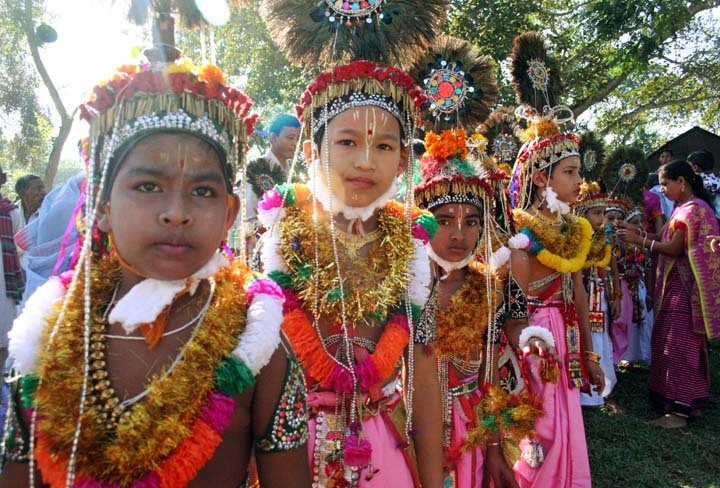 Manipur is situated in on the eastern flank of present day Assam. It has quite a long history, although the name itself appears to be of relatively recent origin. In the Allahabad stone piller inscription of Samudra Gupta(4th century AD) there is no mention of Manipur, although the neighbouring kingdoms are named. According to the Mahabharata, the anicent name of this country was ‘Meckley’ and this is the name that was used when King Gaursham signed a treaty with the British in 1763. Manipur-or Meckley -is actually on a tableland surrounded by hills. It has a large lake-eight miles by five-called Logtak. The people of southern China called this land Meung-kha-la (Meung=Land ; Kha=Lake; La=Wide) and it is clear that this is where the name Meckley derives from. In the plains beside the lake lived a race of people who had sharp Indo-Aryan features and used a language, which was similar to the Kamrupi tongue rather than the Burmese-Chinese group. 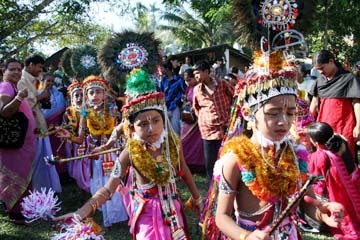 These were the Bishnupriyas. For centuries these people have been called ‘Khalachai’ which in southern Chinese dialect menes ‘Children of the wide lake’ (Kha=Lake; La=Wide; Chai=Children). The other race in Manipur, the Meitheis, moved in from chinese territory and this is reflected in the name. Meithei means,, in Chinese, ‘people of this country’ i.e., Chinese territory. “It is quite probable that the kalachaias are the first cultural race in possession of the Manipur valley,” wrote Rajmohan nath in’The Background of Assamese Culture’. Vaishnavism arrived in Manipur in 1737 in the form of Santadas Babaji ,an enterprising Bengali Baishnad of the Sri Chaitanya School . He came over the hills from Sylhet and captivated the entire population, including the king, with his melodious Kirtana, depicting the life of Radha-Krishna . Overnight, Vaishnavism became the royal faith. It is said that Santadas instigated King Pamheida alias Garib Nawaz to burn all the historical documents in order to make a clean break with the past . Thus, between a ruthless king and ambitious gurn, the history of Manipur was obscured. There is a story that King Pamheiba ordered all his subjacts to bath in the Nongkhrang lake in order to purify themselves. The Bishnupriyas led by the Khumal chieftain initially refused, claiming that they were already purified through adopting the Bishnad faith earlier. Indeed, the influence of the Shankar Dev school of Vaishnavismmcan still be seen in Bishnupriya Manipuri culture ( GK Ghosh, Tribals and their Culture) . This dispute only widened the existing rift between the Bishnupriyas and ruling Meithei class . Large numbers of Bishnupriya Manipuris begen to migrate out of Manipur. this process was hastened by repeated Burmese attacks and soon the once-proud Bishnupriyas became a nation of refugees. Forget Romeo and Joliet, in Manipuri society Khamba Thoibi has grabbed center space. In 15th century AD, Khamba, a prince of the previously routed Khumal Royal family (probably a Bishnupriya ) fell in love with Thoibi – a princess of the Moirang clan ( probably a Meithei ). The union have been to the political advantage of both Khumals and Moirangs ; but the Moirang chief resisted on purely personal grounds. The result was tragic not only for the young lovers but also for the feuding tribes of Manipur. To this day, popular Ballads are sung in the memory of the love affair between Khamba and Thoibi. Who knows if the affair hadn’t ended in tragedy, the couse of history might have been altered; perhaps the Bishnupriyas wouldn’t have been in exile today. It is staggering to learn that in Ghoramara, 100% of the population is literate. There are no millionaires but there are no beggars, either. Everyone works. The women work hardest of all. Swapan’s sister Jharna is a schoolteacher. She is also homing in an MA in Bangla. In between she helps with the housework’s and also finds time to play active rule in Adhunik (Now Manipuri Theatre), the village drama society. Rajkanta Singha, headmaster from a local high school not far from Ghoramara. He talks at lengths about the problem facing Manipuri society. 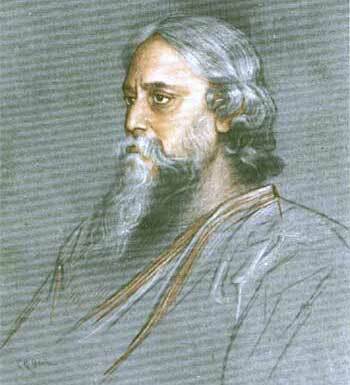 Rabindranath Tagore (রবীন্দ্রনাথ ঠাকুর), the Nobel laureate poet, writer, philosopher is probably the most prominent figure in the cultural world of Indian subcontinent and also was the greatest patron of the Manipuri dance and culture. It was him who popularized the Manipuri style of dance with its high zenith among the people of the world. He deserves the honorable place in the style and regarded as the “Pioneer of Manipuri dance and culture”. From Tagore’s writings and other historical accounts we can learn a little bit about his visit in Sylhet (in present day Bangladesh) . It was 1919 when the historical event had taken place. In November 6th, Rabindranath had a visit in the Bishnupriya Manipuri (বিষ্ণুপ্রিয়া মণিপুরী) village of Machimpur(মাছিমপুর), a remote village not far away from the town situated on the bank of the river Surma. He was given a warm reception there from the Bishnupriya Manipuri people. 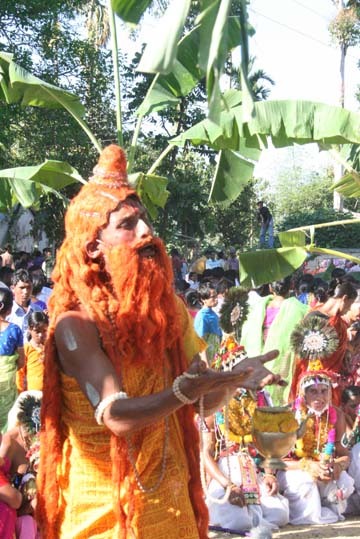 He was so impressed after seeing a dance composition, the Goshtha Lila presented by the Bishnupriya Manipuri women. After seeing the demonstrations Rabindranath introduced himself to the people and wanted to be informed more about their dance and culture. He also met that time exile superintendent Mr Tanu Singha and looked for a Manipuri Oja (dance teacher) who was capable of communicating in Bangla. Mr Tanu Singha introduced the poet with great Guru Nileshwar Mukharjee (গুরু নীলেশ্বর মুখার্জ্জী )of Baligaon. Tagore intended to bring the dance teacher to his idyllic institute, Shantiniketon. In November 7th 1919, in the speech in a historical gathering of students at Sylhet M.C. College hall, Rabindranath mentioned about his experience in Machimpur and the Bishnupriya Manipuri people. The speech was published in a literary journal “Akangkha” of Shantiniketan (1920). Tagore brought back Guru Nileshwar MUkharjee to serve in his Visva-Bharati University at Santiniketan. 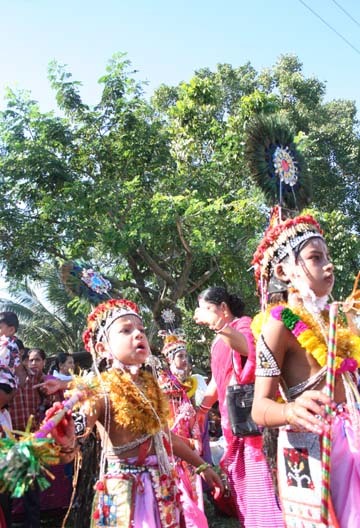 He immediately decided to open a new department of Manipuri Dance in Shantiniketan. Later many other Bishnupriya Manipuri Oja’s and danseuse like Guru Senarik Rajkumar, Nabakumar Singha, Muhu Singha, Guru Bipin Singha, Sri Bihari Singha and Sri Adityasena Rajkumar was invited to Shantiniketon in presence of Rabindranath. They assisted Tagore to choreograph several of his dance-drama. After that period Manipuri dance took its special place in Shantiniketon with Bhatnatyam, Kathak and Kothakali, the other classical dance forms India. In fact Manipuri dance was not as popular as the other classical dance forms. But the subtlety of the tender dance form and the variety of the rhythm impressed Rabindranath Tagore so much that he is credited with introducing this enchanting style to the other parts of the world. 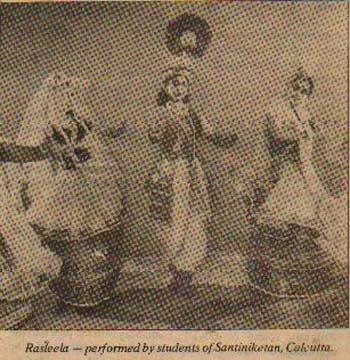 Later many other renowned gurus from Manipur and Assam were invited from to teach this dance form in Shantiniketan. Gradually the practice of this dance form extended outside the Manipuri community and was practiced with great enthusiasm, especially among the Bengalis and other indian people. 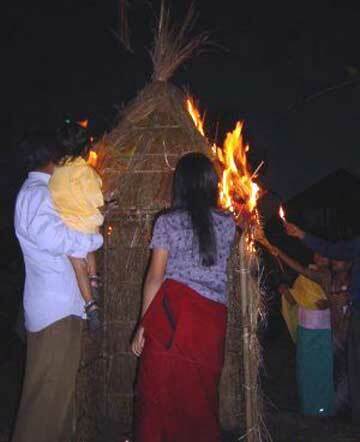 wiping out Satidaho, a discriminating Hindu custom for women. No doubt, Rabindranath Tagore provided a vital link towards the progressive cultural revivalism to the Bishnupriya Manipuri people and produced a band of local artists who enriched their culture. Rabindranath was the source of inspiration for the stimulation of our own dance, songs and music which were on the path of extinction.